Action: Move 1 power from The Starry Sept to a character. Until the end of the phase, treat that character as if its printed text box were blank (except for Traits). 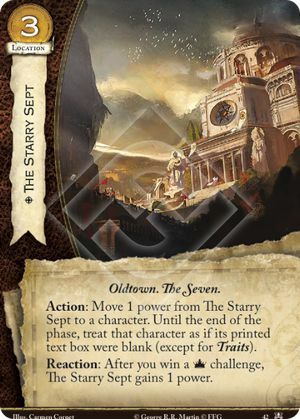 Reaction: After you win a [Power] challenge, The Starry Sept gains 1 power. Power on all cards that you control counts toward winning, so you'll win before you can do this. Power on a location still counts towards the victory condition. No need to move it to a character to win. Could be good in a Stark deck with Catelyn, the Blackfish, Riverrun, Vyman etc.